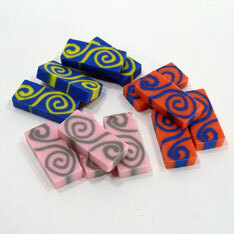 Efficient and smudge-free erasers in dramatic contrasting swirl patterns. Made from rubberized urethanes. 1 inch by 2 inches. Sold by the dozen. Bagged 1 dozen. $0.90 per dozen for 120 dozen or more. $0.80 per dozen for 240 dozen or more.